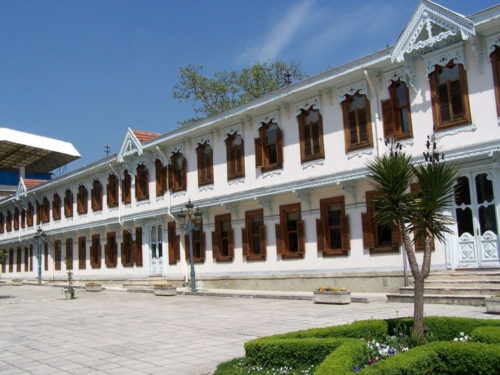 Yıldız Palace, meaning ‘star’ was built at the end of the eighteenth century and was the residence of Abdul Hamid II (the reigning sultan in A Tale of Two Sisters) from 1889 until 1909. Dolmabahçe Palace was built in the mid-nineteenth century and was home to six Ottoman sultans and the last Ottoman khalifate. 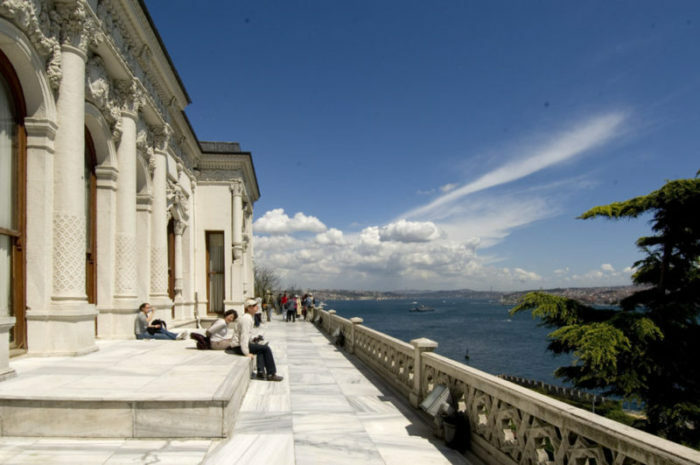 The name Dolmabahçe comes from the Turkish dolma meaning ‘filled’ and from the Persian bahçe meaning ‘garden’. It was a move towards a more Western style of architecture and after the Republic of Turkey was established, the palace was used as the presidential residence. 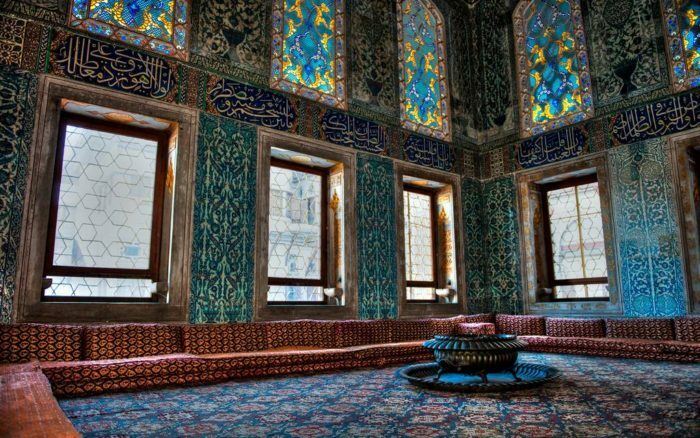 Finally Topkapı Palace, the setting for A Tale of Two Sisters. Built in the fifteenth century, it served as the main residence and administration headquarters of the Ottoman sultans until they built Dolmabahçe Palace by the waterside. 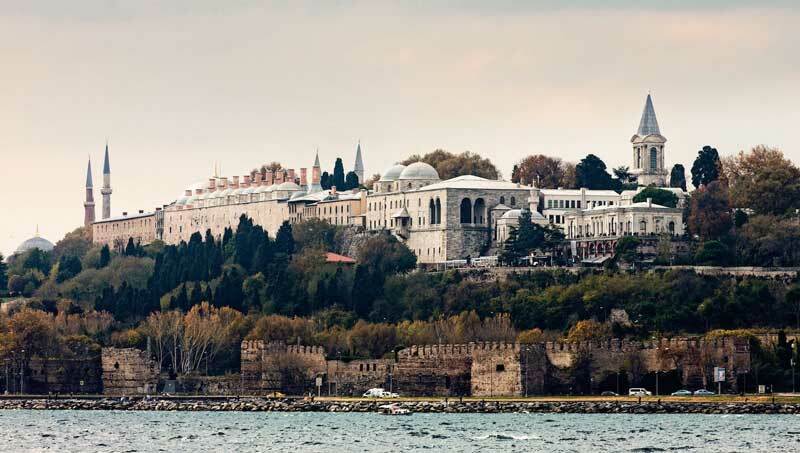 Topkapı is the largest and oldest palace in the world still surviving. At one time, the palace housed some five thousand residents, a city within a city. The surrounding walls were about three miles long. 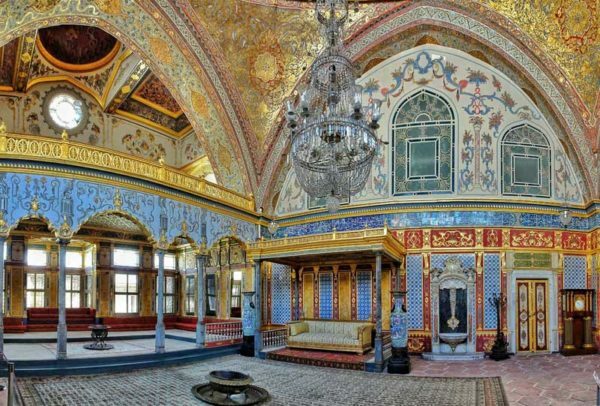 During the four hundred years of occupation, each sultan added a different section or hall to the palace, depending on his taste or on the needs of the time. The palace became a maze of buildings centred around a series of courtyards protected by different gates. 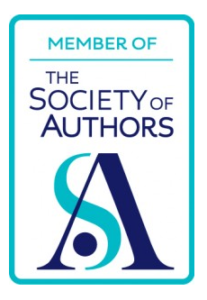 It is so vast, there’s space to mention only a few places – those that play an important role in my novel. The palace is onion-layered, with a succession of gateways leading from one courtyard to another, progressing from public space to private. Anyone could pass through the initial gate, the Imperial Gate, though on foot – only the sultan would ride. This led to the first courtyard, called the Court of the Janissaries (soldiers). 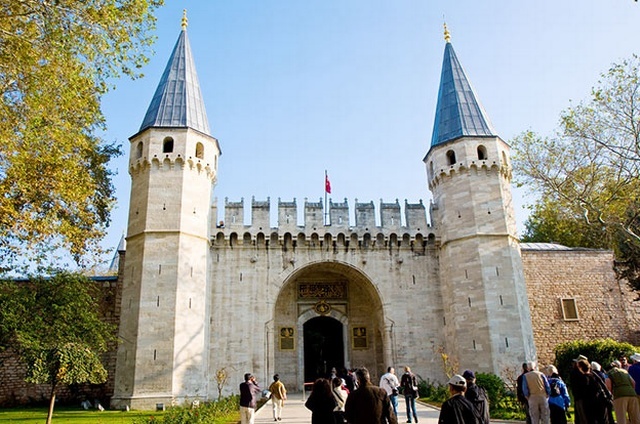 The second gate has two guard towers and is called the Gate of Salutation, because everybody had to salute the sultan before going through it. Only the sultan and people working in the palace could pass. I made this the main gate that first Lydia, then Alice, pass through into the Court of the Divan in A Tale of Two Sisters. 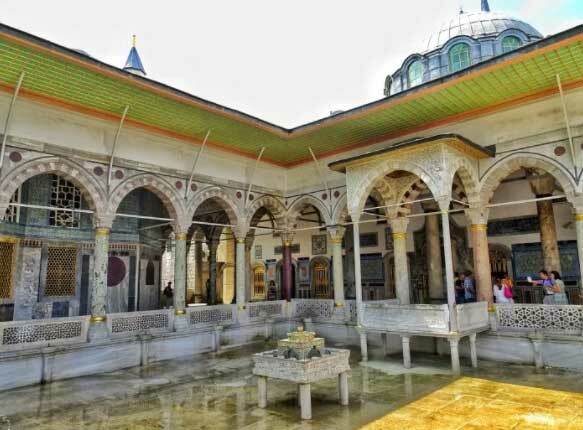 The third gate is the Gate of Felicity – this is where the sultan and his court celebrated important events. 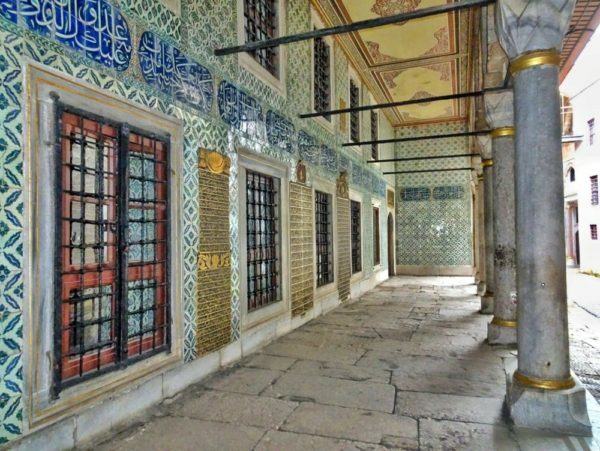 The first building in this courtyard is the Audience Hall where the sultan received his viziers or foreign ambassadors. The magnificent audience chamber was barred to everyone else but Lydia nevertheless managed to infiltrate! And behind this hall is the old library – and in A Tale of Two Sisters, a completely imaginary new library as well! But to pass on to details of the harem, since this is where the majority of the novel’s action takes place. The harem entrance -no ‘whole’ man was allowed access except for the sultan and crown princes. 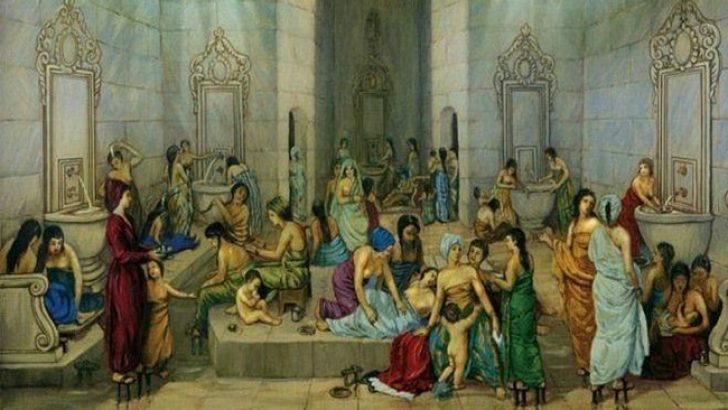 There were four hundred rooms in the harem, a vast and bewildering complex of labyrinthine passageways, cloistered rooms, grand salons and intimate courtyards, the outside world seen only through screened windows. At one time, it supposedly housed 150 concubines. The eunuchs’ quarters, a mere fifty rooms, led on to those inhabited by the Valide Sultan, the sultan’s mother. She was very much the power behind the throne and her rooms testify to her importance. Below is an image of some of the beautiful Iznik tile work that decorates almost every part of the palace, but is particularly rich in the Valide Sultan’s quarters. There were bronze fireplaces to warm the rooms in winter and fountains to cool them in summer. 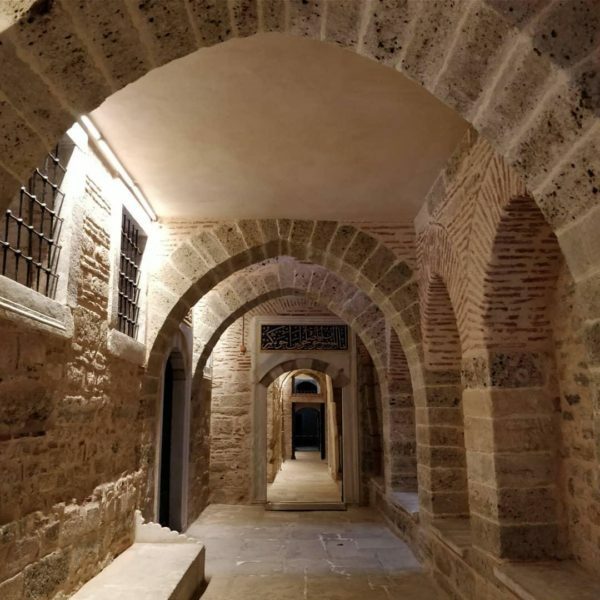 The so-called Golden Way was the passage that joined the Valide Sultan’s quarters to her son’s. Proximity and ease of communication was crucially important for a woman who had her hands on power and was the arbiter of everything that went on in the harem. With so many women housed together and without access to the external world, it was important they provided each other with stimulating company, as well as learning together the arts and skills that would stand them in good stead in their later lives. Below is a picture of the communal space where they would gather and talk. A place of great sociability as both my heroines discover. 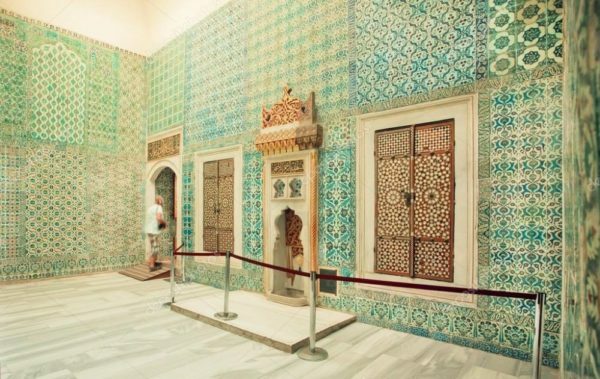 As was the hammam or marbled bathhouse below – a significant centre of female social life in Ottoman times. 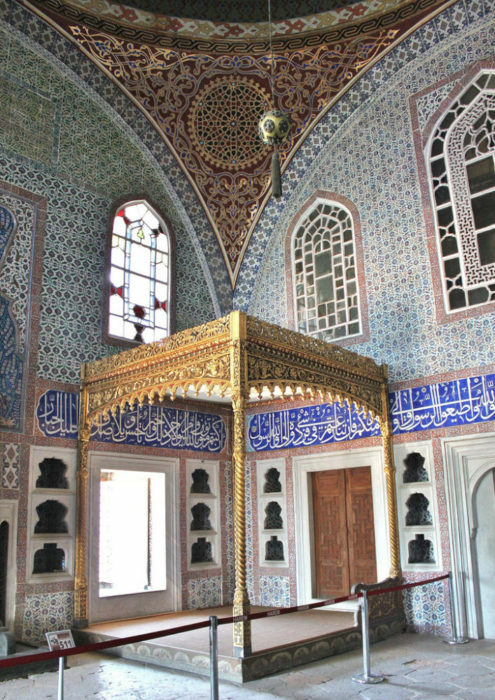 The sultan and his sons lived in the harem, too, and the oldest and finest surviving room in Topkapı is the Privy Chamber of Murat III. It still retains its original interior from the fifteenth century. 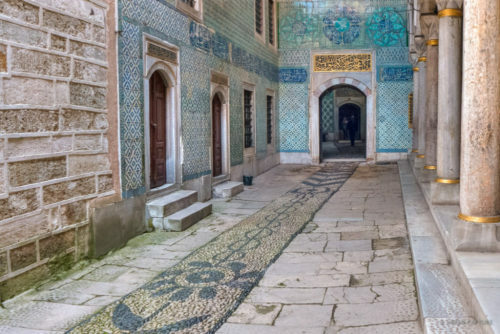 Topkapı is vast and fascinating, beautiful and haunting, and a brief article can’t begin to do it justice. But the images I’ve posted above were very much in my mind when I wrote A Tale of Two Sisters. Here’s a farewell look at an amazing piece of architecture. A farewell look at Topkapı Palace.